I recently had a hard time explaining to my kids the use of folders in hard drives. Hierarchy they could more or less understand, as well as the fact that documents, photos and other files need to be found at a specific place. What they could not come to terms with was content specificity: They simply could not follow my reasoning why any separate topic requires a new folder, found within another folder on the wider topic, found within a folder of the general topic, etc. At some point I understood that it is probably me, not them. I remembered similar realisations whenever I happened to work on younger colleagues’ computers. Desktop clutter aside, they mostly used a very shallow folder structure: One or two levels below the basic folder would generally do, each folder including maybe several dozens of files. For me it is quite the opposite. My hard drive is full of sub-subfolders, however each one includes only a few files, sometimes even only one. Each filename invariably carries the date it was created. Why the difference? If I search back, my first realisation that something was wrong came when I first used Evernote, many years ago. Why did it make so much fuss about tags? And why was there only one level of notebook structure? Even stacks did not seem to do it for me. The same happened when I recently switched from Windows to macOS: Who would possibly wish to organise files based on their colour? However, as signs increase at an alarming pace I cannot help but wonder, am I the exemption and not the rule? Am I the, inevitable, backwards compatibility requirement for any new software release? Or software could, and should, cater for all types of human brains, liberating humans in the process? I belong to a generation that was not born into the digital but was brought up in it. Not that we had any choice. The digital transformation caught us in our early, formative years and it changed everything. We therefore had to adapt what we already knew to the digital. However we were the last ones that were required to do so — the next generation was brought up thinking the internet is a public utility. So I feel that I need to take a photograph and discuss technology’s why and how come. How it all far too quickly became what it is. And, hopefully, how the digital can finally embrace the human. I find that often the breakneck pace of technological progress fails to acknowledge the human condition. These notes are also aimed at helping me to make sense of the digital. Too often those of us involved professionally with it are found in a whirlwind, where new and aspiring world-changing ideas appear and disappear overnight. Technologies not older than our children come to dominate human lives, asking pressingly for well-thought-of regulation. Sometimes I feel that a deep breath is needed, followed by an effort to connect the dots and identify true added value. Why now? Like Renan, it was not until I was well advanced in life that I began to have any souvenirs. And, strangely enough it was the coming into effect of an important new piece of legislation, in 2018, that first caused me a strong backwards impulse, a pressing feeling to re-visit what has been achieved so far. 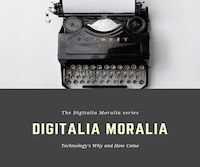 This series is complementary to the GDPR ethics series: It shall take into consideration technology at large and not only personal data processing. Occasionally they may intersect, because indeed the GDPR today seems to be the go-to legal/ethics panacea for any and all new technologies, however while the GDPR ethics series is aimed at explaining its moral principles and policy options this series is aimed at discussing the why and the how come of information technology affecting our daily lives. So, coming back to the folder structure, I believe that the gap between my own computer files’ organisation and that of younger generations came to be because I actually have worked with a filing cabinet. I was therefore trained to compartmentalise information. To think in terms of paper files and alphabetical or chronological indexes. Without them any paper file would be useless. Tags or colours were simply irrelevant. On the other hand information technology allows a variety of searches onto any collection of data. A “structured set of [personal] data which are accessible according to specific criteria” is no longer necessary. It may even be unwanted, divulging personal biases of the organiser (as in algorithmic bias). Ultimately, a folder system may not even be needed at all. Humans need to make information accessible to them: If this can be achieved in any number of ways, why spend time and effort organising it as if filing cabinets could be replicated on hard drives? So, why do Windows and macOS developers still bother with folders? Why does Evernote still use stacks? Why does OneNote replicate a typical, traditional, old-fashioned paper notebook? One explanation would be, so that my generation (now prime and supposedly able to pay users) can still feel at home. A more plausible one would perhaps be that humans need to categorise, in a more or less Aristotelian manner. Whether this human-userbias is inevitable, because humans for the moment design and use these technologies, and, if this is true, whether it is developing a crippling or an enabling effect for both (technology and humans), is exactly what this series is set out to explore.